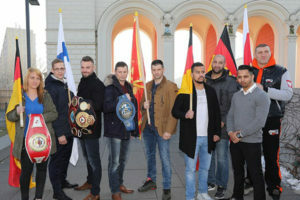 The kickoff press conference for the March 18 clash in Leipzig, Germany, tool place Monday at the Bayerischer Bahnhof restaurant. European light heavyweight champion Robert Stieglitz (50-5-1, 29 KOs) makes his first title defense against Nikola Sjekloća (32-4, 11 KOs) and WBO/WBA Inter-Continental light heavyweight beltholder Dominic Boesel (23-0, 8 KOs) faces undefeated Finn Sami “Boom Boom” Enbom (14-0, 7 KOs) on a card that will feature five title fights in all. In heavyweight action, Erkan Teper (16-1, 10 KOs) comes back against Mariuz “Viking” Wach (32-2, 17 KOs) for the IBF International title. Former world champion Yoan Pablo Hernández is the new Teper trainer. Also, “Team Germany” welterweight Phillip Nsingi (6-0, 1 KO) faces Kasim Gashi (9-0, 4 KOs) and female featherweight Sandra Atanassow (5-0, 2 KOs) meets Gabriella Busa (4-7, 2 KOs) in a pair of German International title bouts.